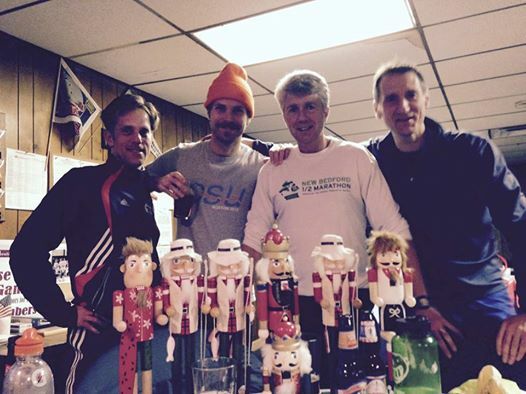 On Saturday, December 13th, four of my CSU teammates plundered the prize table at the “Assault on Mt. Hood” cross country race, held annually at the Mt. Hood Golf Course in Melrose. It has become a tradition for members of the club to run the race, and, as Kevin says, the major attraction is the prizes — festive nutcrackers in funny costumes, eminently suitable for display, no matter how much you dislike the Christmas holiday. While naturally I’m jealous at seeing my friends walk off with such a haul, it got me to thinking… Over the years, what races have had the best, or at least the most memorable, prizes? Have any of them topped nutcrackers? Some folks will, I’m sure, say that cash is the best prize. I acknowledge that earning money from a race is gratifying. But for most of us, the sum of all our paydays over our entire racing careers won’t even pay for our race entry fees, let alone our running shoes. So for all of us non-professionals, going home with a an awesome prize might be even better than going home with a check. One of the first prizes I ever won was a gift certificate to Sears. I’ve told the story of how I gave it to my young bride (the handyman in the house), who used it to purchase a cordless drill. I’m sure I’ve told the story elsewhere of how, for many years, that drill helped me justify doing long runs on Sunday mornings instead of chores around the house. There have been prizes of shoes, socks, and other running gear, but winning a pair of socks at a race is pretty much exactly like getting a pair of socks for Christmas. It’s appreciated, but hardly memorable. On the other hand, sometimes you get gear that’s really useful and unique, like the weird lunar surface-colored gore-text rain suit I won at some race in Newton many years ago. I had that thing for years, and even though it grew uglier as it (and I) grew older, I always enjoyed pulling it on and remembering that I hadn’t paid a dime for it. Speaking of wearable prizes, the fake plastic viking helmet that I won at “The Place Race” was one of my favorite awards of all time. I’m always tempted to wear it on runs, but I’d really need to grow my beard about a foot longer than it is now to make the look work. I like getting glasses or mugs for races. The aforementioned Mt. Hood race used to give out beer glasses, as did the Lake Winnipesaukee Relay. I truly cherish my Lake Winni beer glasses, and I sometimes wonder if the only reason I drink beer (on the rare occasions that I do) is because I like having a reason to bring out those glasses. I’m the same way with mugs. I have a mug from the New England XC Championships, a mug from a New year’s Day race, and a couple of mugs from the Cape Cod Marathon that have my finishing time and place on them. I really try to use these mugs, too, and always find myself with happy thoughts thinking about the races where I acquired them. Other than that gift certificate to Sears, I can’t say that I’m wild about gift certificates. Usually, I never get around to using them, or when i do, any association with the original race experience is lost. Maybe instead of sticking them in an envelope that gets forgotten under a pile of papers on my desk, I should make a collage of gift certificates to the various establishments that were arm-twisted into supporting the race. Now, maybe you think I’m being arrogant, talking about all these prizes. But the thing is, just being around for long enough and running a lot of races, you’re bound to get a lot of prizes eventually. And sometimes the smallest races have the weirdest and best awards. One time I went home with a painting. Another time with a piece of handmade pottery. And still another time I walked away with entire bushel of apples, although come to think of it, the apples were a raffle prize, not a prize prize. Which bring us back to nutcrackers. It seems to me that one of the great thing about nutcrackers is that they are an annual tradition. And so every year, a couple of weeks before that big commercial holiday, Kevin and the gang run over hill and dale for the chance to add recruits to standing armies of nutcrackers already taking up space on living room shelves. And even though you can’t use nutcrackers as legal tender, can’t eat them, drink them, wear them, nor redeem them for valuable power tools — Hell, they don’t even crack nuts — they do add that festive touch to even the most heathen hearth. This entry was posted in Attempts at Humor and tagged mt hood, nutcracker. Bookmark the permalink. Heathen hearth! That describes my home precisely. It’s always nice to get anything at the races. Even if it is just a cheap plastic trophy, it is some positive reinforcement showing that maybe I am not completely wasting my life away by spending all those hours running around. It’s always a treat to get an award that is unique and useful. Kudos to the race directors who spice up the prize table. I want to see you toeing the Mt Hood starting line with us next year!